CNH’s lousy earnings report rained redness on everybody in the construction sector Thursday. 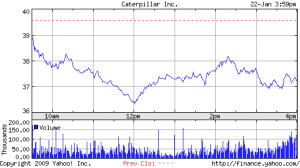 Caterpillar got spanked pretty hard in the early going but rebounded a bit as the day wore on. News that Microsoft planned to lay off 5,000 didn’t help the mood much, either. Full quote at Yahoo Finance. The major indexes weren’t nearly as bruised: Dow, down 1.28%; Nasdaq, down 2.76%; S&P, down 1.52%. Closing wrap-up at Market Watch. Nothing good to say about Cat’s volume today (unless you’re short): At 19 million shares, it’s way, way over the average of 11 million — about 80 percent above normal. Not what bulls want to see on a big down day. Trader Mike was one of the pioneer financial bloggers. He earns a living by day trading but his blog has become so popular he can afford to take month-long breaks these days. His Christmas break is over so he’s back to posting essential write-ups on what the charts are telling him. Much of what I know about technical analysis, I learned from Mike’s blog. He knows tons more — and has his own computerized trading system designed to tell when to get in and when to get out. His blog may often offer more than casual investors need to know, I suppose, but I’ve found it invaluable. I created my first blog in 1996 — Banned for Life, devoted to removing annoying cliches from the rhetorical toolboxes of the nation’s newspeople. One of my motivations: Every time CNN or ABC News or the New York Times parachuted one of their star journalists into my hometown, there’d always be a grating reference to how things are “playing in Peoria.” I just wanted to smack ’em. I thought of Banned for Life when I happened upon this list of headlines on Caterpillar-related stories at Forbes.com. Not one but two “Cat’s Meow” headlines in the past six months. Ugh. You kids got a month to put the magazine out and that’s the best you can come up with? Even at the daily fish-wrap factory where I work, we check the archives to see how many times our attempts at cleverness have been published before. OK, I’ll get back to blogging about tractors now. Just had to get this one out of my system. I hate cliches with the fires of a thousand suns. What I’m not doing is making any predictions for ’09. If I knew where Cat’s stock was going, I wouldn’t have time to blog about it (nor would I provide such info for free). But anyway, Big Picture blog highlights the worst predictions of 2008, perhaps as a cautionary link to those with the predictive urge. Peoria Pundit, aka Bill Dennis, writes more about Peoria’s politics than anything else, but most major Caterpillar doings get some coverage. I have no idea who put this idea into his head, but today he put a call out, offering to host Cat-related blogs. Of course, any insiders who want to blog what goes on the shop floor or behind closed doors at Caterpillar World Headquarters would have to be anonymous. And I would be happy to help, perhaps with a group blog focusing on Big Yellow. I’m sure the Yellow Father would welcome the scrutiny. I’ve added a news feed from Twitter.com to post quickie headlines about cool stuff not directly related to Caterpillar and its stock performance. Most folks use Twitter to announce their new choice of underarm deodorant or complain about their rectal itch flare-ups, but a crucial minority use it to share headlines and quick observations of news events in real time. When news breaks, Twitter posts start showing up almost immediately: Journalists are already learning to just check Twitter first to find out what’s going on in the world. Stock market bloggers are using Twitter too. My favorite example is Brett Steenbarger, who typically writes one post a day about the psychology of trading, but uses Twitter to post market stats on trends as they arise. Paul Kedrosky’s Infectious Greed is another popular blog among techies who follow the markets. His Twitter feed is always interesting. There are tons of Twitter tools to help you learn the ropes. One of the handiest is Twitter Search.